(93cm x 118cm / 37" x 47") The title, 'The Face of God,' is inspired by Sir Ken Robinson's TED Talk, "Do schools kill creativity?" He charmingly tells the story of a child who is asked what she is drawing. When she answers that she is drawing God, her teacher replies, "But nobody knows what God looks like?" To which the child confidently rejoins, "In a minute they will!" 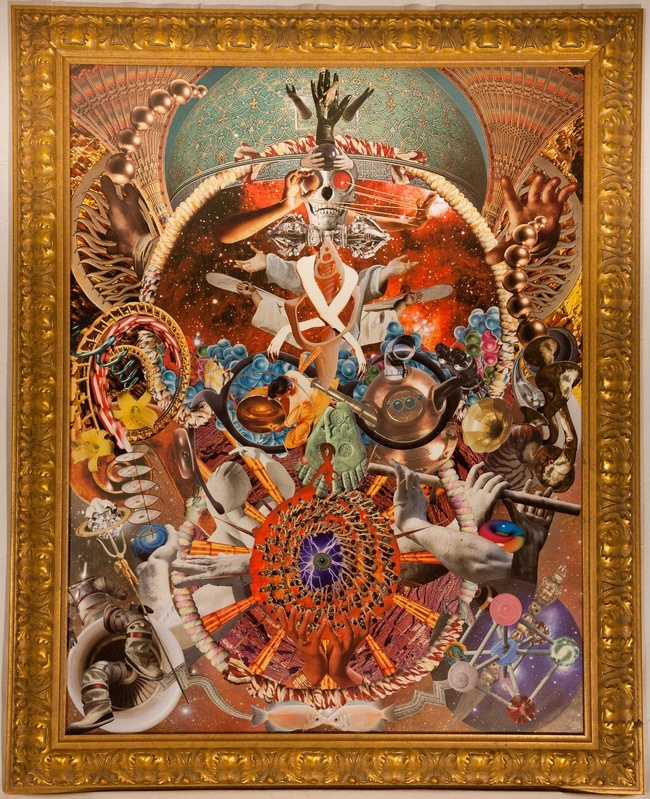 The collage presents a syncretistic theological depiction of God, combining beautiful images from music, architecture, sculpture, nature, and fabric, interweaving designs and ideas at once. The outline of God's face is a knotted batik cloth. The dome of the Shah Mosque in Isfahan serves as headdress. Various symbols float in the cosmos of the cranium: a simian skull, the Hindu sacred thread ceremony (Janev), the Dorje-thunderbolt of enlightenment, Christ's redeeming arms, the Japanese crane dance, languid Arms of Serenity draping the cross-section of a Conch. The Conch represents the expansion and contraction of the Universe; Vishnu blew into the Conch to make the first sound in the Universe, which is OM. Hands on either side of the cranium reach back and forward to the beginning and ending of Time, represented by threaded golden beads. Eyeglass frames encircle all-seeing eyes. The pupil of the eye on left is a glowing galaxy center on the head of a drum, held by its drummer peering into it. The eye on right contains an old diving helmet from whose windows spring a telescope, periscope, microscope, and spider eyes. Footprints of the Buddha suffice for the nose. The left ear is formed by a roller coast and cellos' scroll. The right ear is made up of tuba bells, a gramophone horn, and a nautilus shell. The mouth is formed by a troupe of seated gyrating Ramayana Monkey Kecak dancers from Bali. To the left of the mouth is an arm launching worlds. Just above is an overhead view of a stone head shielded by an arm. The head is peering out at the Cosmos of the left Eye. On the right side of the mouth are three hands playing the flute of Krishna. In the lower left corner is a floating space suit, the glove of which holds Shiva's trident upon which sits a Baha'i temple atop a diamond. In the lower right multi-dimensional orbs within another expanding universe are pierced by a Lama's dagger.